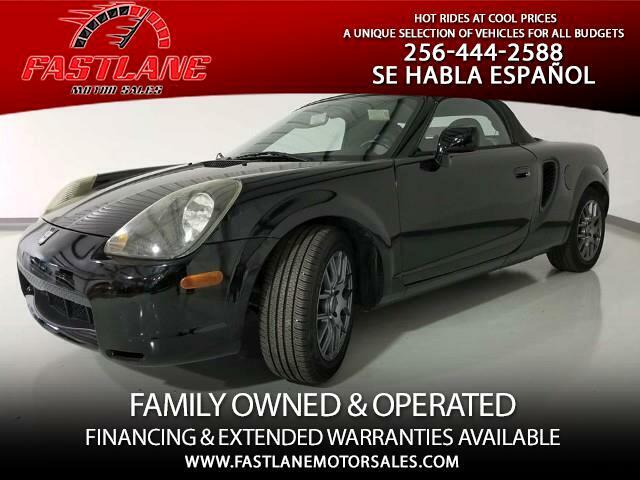 2002 Toyota MR2 SPYDER- Black On Black! New Tint! Aftermarket Rims And Exhaust, Very Rare And Fun To Drive! It Is A Manual But No Clutch Pedal!?? Push Button Or Bump Shift! All The Fun Of A Manual But No Stalling And You Don't Have To Down Shift Unless You Want To.This naturally aspirated 4-cylinder mid-engine rear wheel drive convertible is a BLAST to drive! These vehicles are surprisingly nimble, and peppy boasting a mere 140 horsepower from the factory. The mid-engine setup really helps with weight distribution; allowing it to whip through turns and stay planted.It is powered by a 1.8 liter 4-cylinder engine; which is mated to a bump-shift operated clutch-less sequential manual transmission. This Toyota MR2 has been customized with an aftermarket tubular exhaust manifold, as well as aftermarket wheels. This fun ride can be yours at the reasonable price of $5,950!